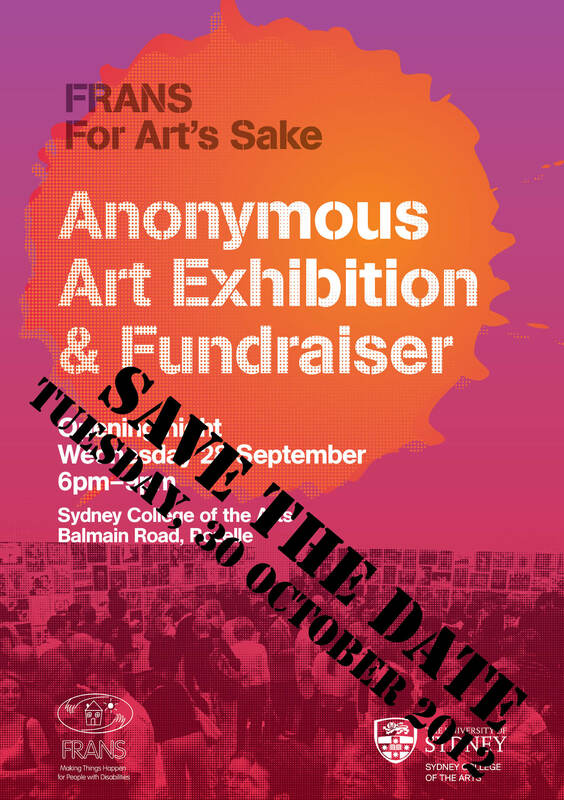 FRANS, a Sydney-based non-profit organisation who supports people living with disabilities and their families/carers, is holding its annual For Art’s Sake exhibition and fundraiser, 30 October 2012. In its fourth year, For Art’s Sake is the charity’s exciting annual fundraising initiative, highlighting the unique and inspired contributions that all people make towards Sydney’s creative community, as well as drawing attention to the invaluable contribution people with a disability make to our society, their universal rights for access and inclusion, and to the immeasurable value of support their families and friends afford them. More than 400 professional and emerging artists, celebrities, people with a disability, friends and families are invited to create and donate an artwork to the exhibition. In past years we have exhibited pieces by renowned artists, such as the Archibald winner Garry Shead, Indigenous 8/prize winner Jody Broun, or contemporary artists like Reg Mombassa, who have all generously donated their work. The For Art’s Sake exhibition opening night is being held 30 October 2012. Deadline for canvas submission: Friday, 28 September 2012.